The Olympics are over and I am bereft. What was life like in the Before Time, all those weeks ago? I'm not ready to go back! I vaguely remember working at my desk rather than streaming footage of women's judo, watching Don't Tell The Bride marathons rather than actual marathons, and knowing absolutely nothing about dressage. 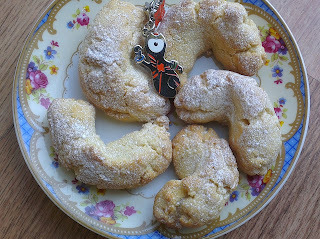 Let's ease ourselves gently into the real world (before gearing up for the Paralympics) by doing some easy baking. These walnut-sized biscuits, dusted with icing sugar, are deliciously moreish. Originating from Greece, you can snack on these while dreaming of the country that started the Olympics. Or just dreaming of the Jamaican men's relay team/Swedish women's handball team. Whatever takes your fancy. Add a shot of brandy or other strongly flavoured spirit to give these shortbread-style treats a kick. Preheat the oven to 180C/350F/gas mark 4. Line a large tray with baking paper. Cream the butter and sugar until light and fluffy. Beat in the egg and vanilla extract. Sift in the flour, almonds and spices. Fold them in until it just forms a soft dough. Take a tablespoon of the mixture, roll into a sausage and shape into a crescent. Pop it on the tray and repeat with the rest of the dough. Bake for 12-15 minutes until the edges are brown. Leave to cool on a wire rack, then dust with icing sugar. Eat with a large cup of tea. Yep - Sara mentions that in the second paragraph! Instead of adding cloves, once these are cooked dip them in rosewater, then coat them in the icing sugar and leave to dry. You get the most delicate yummy little biscuits ever with a slightly crispy light shell and a soft middle. My mum makes them every Christmas. Ooh, yes please. I hate cloves!